Tomorrow, Thursday May 17, 2018, is the first anniversary/Solar Return of the appointment of Robert Mueller III as Special Counsel to investigate Donald Trump, the Trump campaign, his associates, and their ties or conspiracies, if any, to or with Russia and Vladimir Putin. On Thursday, the Sun will precisely return to its 2017 degree at 5:44 pm edt (based on its 2017 degree at noon edt). 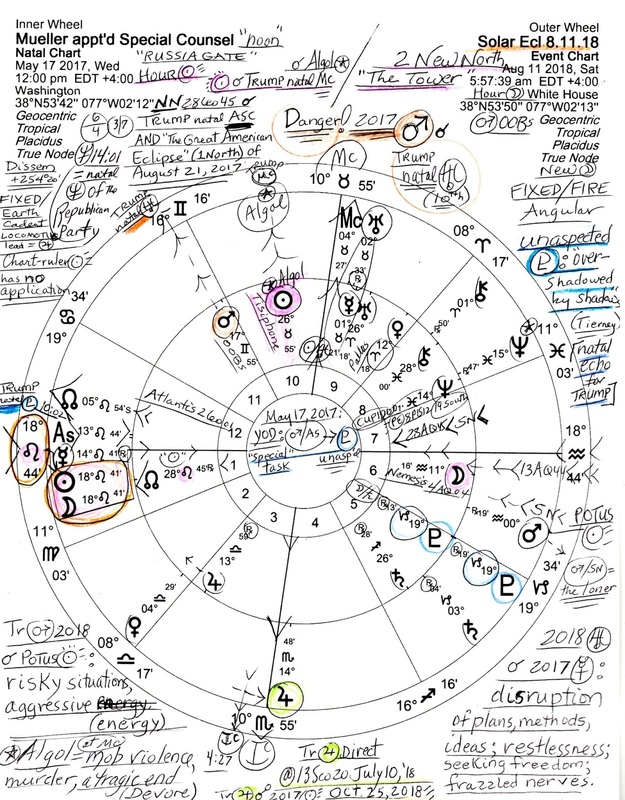 In the Solar Return 2018 chart (not shown), Midheaven @2Leo27 sports the 2017 position of asteroid Atlantis @2Leo01 (abuse or misuse of power; divine retribution; feelings of doom). Obviously, the themes of astrological Atlantis are very much a part of the Mueller investigation into the affairs of Donald Trump and we may also wish to note that in 2017, Nemesis, the unbeatable foe, opposed Atlantis. And here's a cosmic curiosity: 2Leo+ also happens to be the position of personal name asteroid 'Mueller' on the day of Robert Mueller was born! (you can't make this stuff up). On May 17, 2017 (Washington DC), the Sun @26Tau55 conjoined the nastiest star in the heavens, Algol, of Medusa-Head fame, the occupant of Mr. Trump's natal Midheaven. Regretfully for Mr. Trump and for the country he now haphazardly leads, enraged Algol at Midheaven has an especially malevolent reputation for potentials such as mob violence, murderous tendencies, and the possibility of a tragic end (Devore). Along with royal Regulus rising (success if revenge is avoided--otherwise, all that's gained will be taken away--Brady), this has been the cosmic condition of Donald Trump since birth (natal MC) and the Mueller probe is now the spotlight shining brightly upon the star's turbulence and affecting the enraged Mr. Trump's career and public reputation on the world stage (MC). 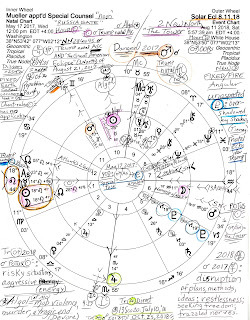 Of course, you see that Mr. Trump's natal IC @25Scorpio is affected (family; domestic scene) as transit Jupiter in Scorpio approaches and readies to enter Trump's natal 4th house from whence his his natal Uranus-NN-Sun trio will eventually be opposed--conflicts and unfavorable conditions are indicated for an extended period once the Jupiter oppositions begin in 2019. (Also see the penned note, bottom center of the chart: "transit Jupiter oppo 2017 Sun Oct 25, 2018".) Yet some respite may be felt for transit Jupiter will also conjoin Trump's natal Moon @21Sag, usually a happy time unless negative conditions interfere overmuch. For him this may be the case due to his natal Moon-South Node conjunction visited by tr Jupiter so perhaps happy expectations won't be met since a Jupiter-SN contact often denotes blocked endeavors and ethical clashes (as with current conditions). 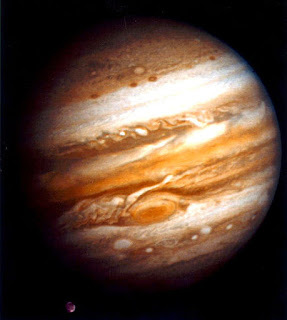 Actually, a look back at the period when this transit of Jupiter occurred about 12 years prior would be fruitful for those who have the time. As for the bi-wheel pictured above, the outer chart of The Tower Solar Eclipse of August 11, 2018 @18Leo41 is shown because of the involvement of Trump Tower in the ongoing Mueller investigation and the structure's location of at least two significant meetings (June 9, 2016 and December 12, 2017) under Mueller's scrutiny when Russians came to call--and because Trump is so very proud of this building with his name upon it. Plus, this Solar Eclipse conjoins the noon Ascendant of May 17, 2017 (Washington DC) and so I have used it to show upcoming transits to Mr. Mueller's appointment. Also note that a Solar Eclipse in Sun-ruled Leo indicates that karmic progress can only be made if the negative qualities of Leo are avoided--pride, vanity, egocentricity, pomposity, and ostentatious display (Lineman). It also confirms a karmic relationship with one or more offspring--offspring such as Donald Junior whose involvement in the Trump Organization and actions during the 2016 Campaign such as contacts with Russians and others are in the cross hairs of Robert Mueller's Special Counsel investigation. Now planet Pluto of the (criminal) Underworld holds an important position in both charts @19Capricorn+ but in 2018 Pluto is unaspected and thus detached from any planet in the Eclipse chart, and unable to offer its regenerative power. 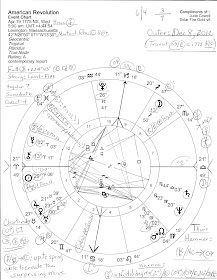 For Donald Trump this condition of a lonely Pluto is a 'natal echo' since his natal Pluto @10Leo02 is also unaspected which I have previously termed "overshadowed by shadows" as we recently discussed when we took a ginger step into Donald Trump's 12th house of the Unconscious. And perhaps you remember that May 17, 2017 happened to be the very date of the first of five Neptune Returns (14Pis01, as you see!) 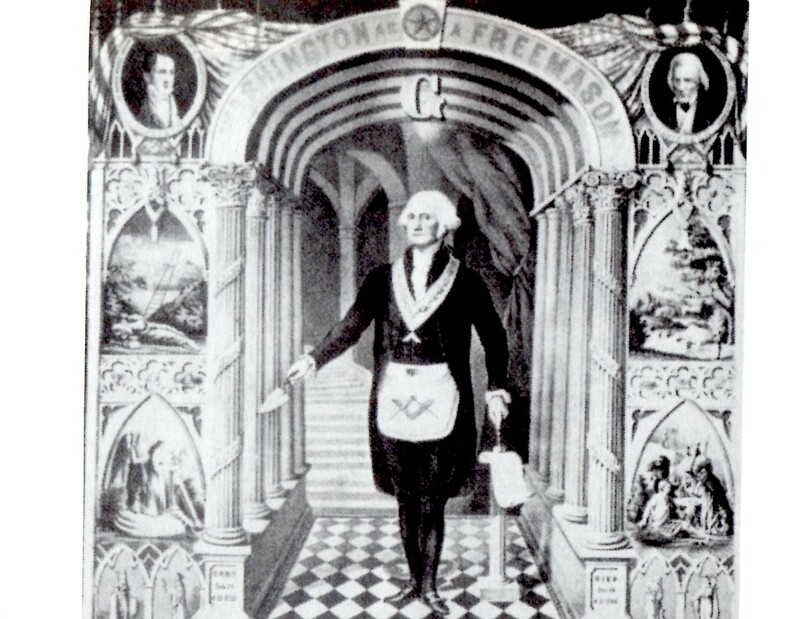 of the Republican Party (of 1854). Synchronicity much? The last of the five conjunctions perfects on December 29, 2018 which takes party members into 2019 with a disappointing wilt rather than a bang. And as you know, a difficult star inhabits the region of 15Pisces--Achernar = crisis at the end of the river, or, the risk of rapid endings. Yes, many Capitol Hill resignations have been announced with the probability of more to come--plus midterm election losses in November if a 'Blue Wave' is allowed to wash over America and voters mobilize themselves in great numbers. Earth-Air Sun Taurus-Moon Aquarius: independent, fair, honest, morally sound, shrewd, tenacious, objective, realistic, committed to principles, resourceful, trustworthy, and capable; can be stubborn and overconfident which can come across as conceited. (Sun Sign-Moon Sign, Charles and Suzi Harvey). Related: 'The Tower' Solar Eclipse of August 11, 2018 happens to be the Prenatal Eclipse of the 2018 Midterms (horoscope shown with a link to eclipse details).